What a fantastic idea! 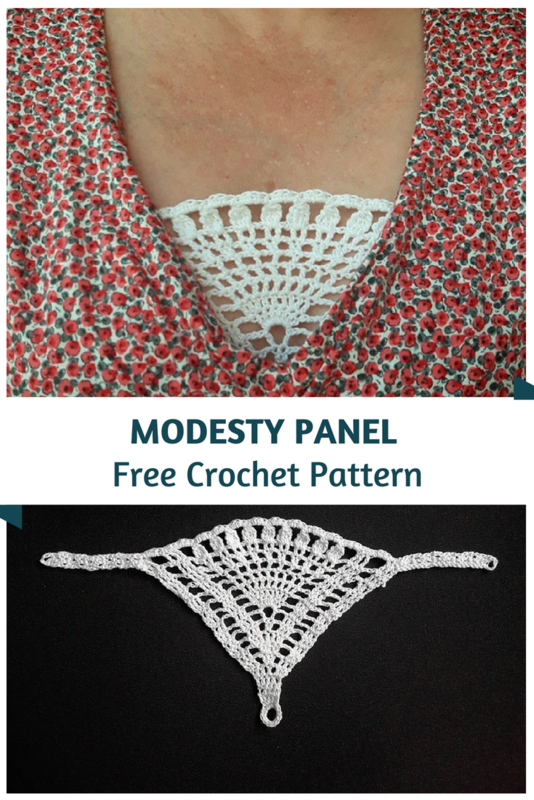 Crochet Modesty Panel Pattern by Cristina Popescu is a very clever pattern, a simple triangular piece of lacy crochet that you ca wear attached to your bra and underneath a low cut top so you will not show too much cleavage. Say bye to having to use a tank top or other layer. This cute panel pattern is really fabulous! [Free Pattern] These Little Strawberry Booties Are Really Precious! This is a great idea! 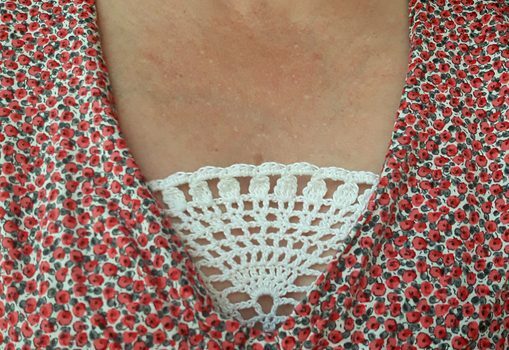 I just had the problem with a gaping blouse. I am going to make a few in different colors. I am also sending this pin to others. How do I get the written pattern for the mosdesty panel? scroll down to the picture of just the modesty panel. under it there is a paragraph. near the end is the creators name, Cristina Popescu. click on her name and then find the underlined link to: a free ravelry download. that will download the pdf to your computer. Hope this helps. I found it……go back to where you see the picture. Under there it says Cristina Popescu and press, then follow to download. Let me know how you make out. By clicking on Christina’s name in the post. It will take you to ravelry.com where it is a free download. I can’t find instructions for modesty panel either. Why? I successfully made it. But the problem is, the finished product seems too small for the purpose. Don’t you have other bigger pattern? Thanks! I really love this idea. I am a modest person and don’t like pulling my sweater, dress, etc. up all the time to see if I am showing my private parts. This is GREAT! Will have to make a lot of them for me and my cousins.